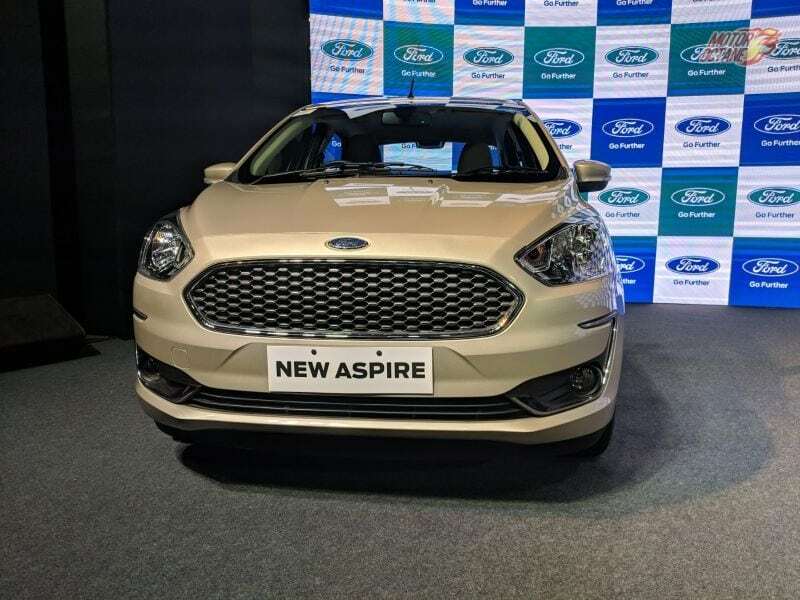 The 2018 Ford Aspire has been launched. This car is already in production and the company is building up stocks to be transported to dealers just before launch. The car has gotten various upgrades and a slight redesign. The rear portion does not see much change. However, the front has a new grille, with a mesh effect. This makes the car look different. The company has stopped production of the current version and the last car rolled out in April. The production has now shifted to the new model. The new Aspire also gets feature upgrades. The changes to the new 2018 Ford Aspire facelift are subtle. This is not a major facelift. This has a touchscreen, which is similar to the one on the Freestyle. There will also be a new 1.2-litre petrol engine offered. This engine will get an automatic transmission as well. The fuel efficiency also will be improved now. Here is an exterior shot of the car from the front. The car will be getting a front fasica too. It is not an all new car and is only a model year update. The Ford Aspire is one of the best looking compact sedans in the market and the new one will look more premium. The facelift will be getting new features as well. It will have an option of six airbags, making it very high on safety, as it has been earlier too. A new 1.2-litre petrol engine will be offered now. This will be more powerful and offer even better mileage too. Ford will be looking at enhancing sales of its petrol engine and this will be a key one, especially when the sales of automatic are high. The Aspire facelift in India starting at ₹ 5.55 lakh for the base petrol Ambiente trim and going up to ₹ 8.14 lakh for the top-spec diesel Titanium+ variant. The petrol-automatic combination is available only on the Titanium trim and is priced at ₹ 8.49 lakh. 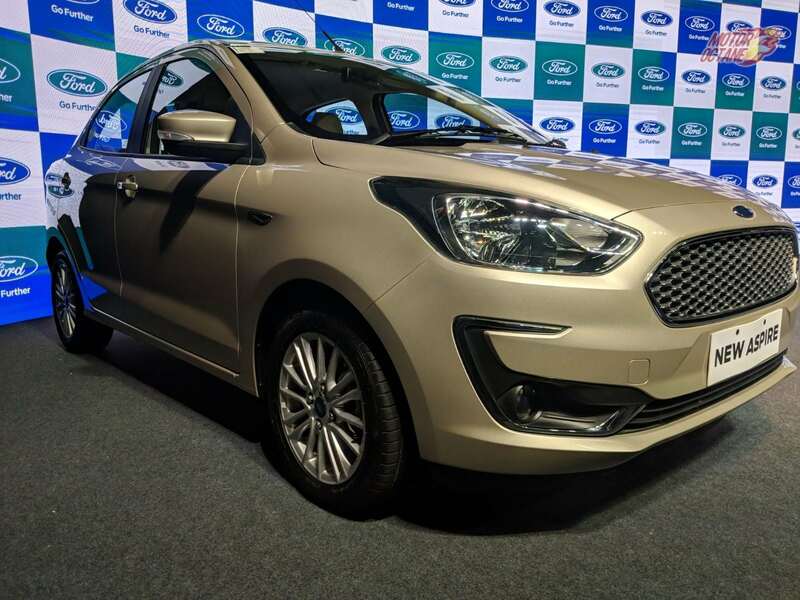 The new 2018 Ford Aspire facelift has been launched. This will be an ideal time of the year to get it. It will be around the festive season. This will help Ford to enhance its sales numbers. The design of the Ford Aspire has seen some tweaks. Being a titivated version, there isn’t a change in the dimensions. The fascia sees an update in design, a new front grille, stylish headlamps with a smoked out effect. The Aston Martin look continues. The front fog lamps and the front bumper will be revised too. 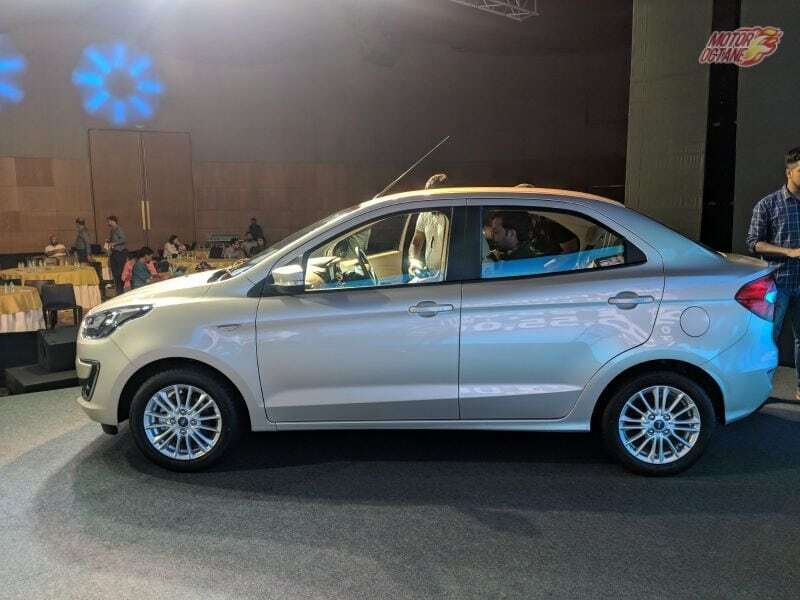 The side profile of this compact sedan looks the same. The design is well proportioned and it does stand out in the styling. At the same time, the rear will also get a minor change too. It is majorly the snout that shall undergo transformation. The interiors of the Aspire make it look stylish and appealing. 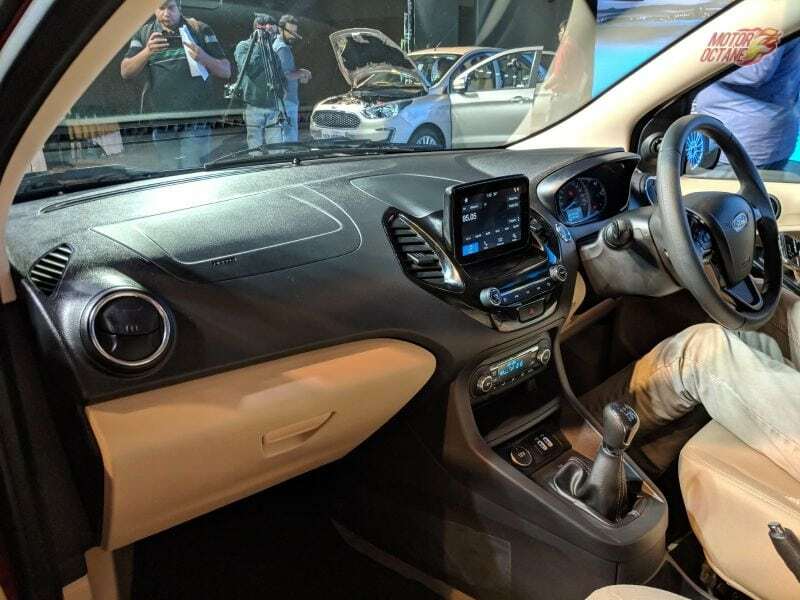 The facelift is likely to get more features like keyless entry, 8-inch touchscreen system with SYNC 3, reverse camera, navigation and even Android Auto. The touchscreen resembles Fords unit in the EcoSport. The interiors of the Aspire will be black and beige. This will make it an exciting package. The space on offer shall remain the same. There will be no difference in the space on offer. The front seats are large and comfortable. There is more than sufficient headroom and knee room for the passengers up front, while the space in the second row could have been a little better, at least in the knee room. The boot size is also large enough on the Aspire making it a great product to consider for a weekend trip too. Also Read: Ford to build SUV with Mahindra? The new 2018 Ford Aspire will have a new 1.2-litre Dragon petrol engine. This will have a five-speed manual and also a six-speed automatic. The engine will be similar to the Ford Freestyle. The other engine is the 1.5-litre diesel engine and it will churn about 98bhp of power and 200Nm of maximum torque. This comes mated to a five-speed manual transmission. These engines have more than sufficient power and torque, with the diesel being the most powerful option. The 1.2-litre has decent power. There isn’t a major change the power of the diesel engine, some fine tuning with the change in wheel size. The major update is the petrol engine. The fuel-efficiency on the Aspire is about 12km/l in the city for the petrol manual, 16km/l on the highway. Moving to the petrol auto, it should be about 11km/l in the city and 14km/l on the highway. The diesel engine is highly efficient returning about 17km/l in the city and about 20km/l on the highway.